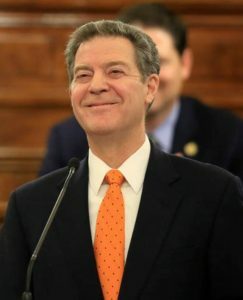 Home » Posts Tagged "Brownback"
Governor Brownback’s plan reneges on a promise made last year after delaying KPERS payments. Budget hole for remainder of this year estimated at $350 million grows to $600 million next year. Brownback wants to freeze KPERS at 2016 levels while refusing to pay back with interest last year’s delayed payments as he promised. Brownback’s proposal would further delay KPERS actuarial balance by a decade from 2033 to 2043. Brownback’s KPERS attack and broken promises are a one-time fix for the budget mess that only helps to solve this year’s problem. Brownback launches another attack on KPERS to pay for his reckless and irresponsible tax policy. In 2012, Gov. Sam Brownback conned the Kansas legislature into passing a discredited trickle down economics tax plan. He promised a shot of adrenaline to the heart of the Kansas economy. 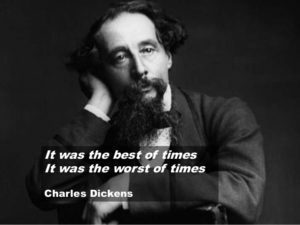 Instead, we have suffered through years of collapsing revenue while Brownback, to preserve his tax plan, robbed the highway fund to near bankruptcy, slashed the state budget to the bone and then into the bone, and raised sales taxes to record highs. All of this in the defense of tax cuts for the wealthiest Kansans. Tax cuts that middle and low-income Kansans are being forced to pay for. Last year, in a desperate move to plug the drain on the state budget, he approved a delay in paying $100 million to KPERS while promising to pay it back with interest. In the meantime, the state’s revenue situation continues to collapse and the state budget is in a roughly $350 million hole for the last six months of this fiscal year. That hole is expected to be about $600 million next fiscal year. 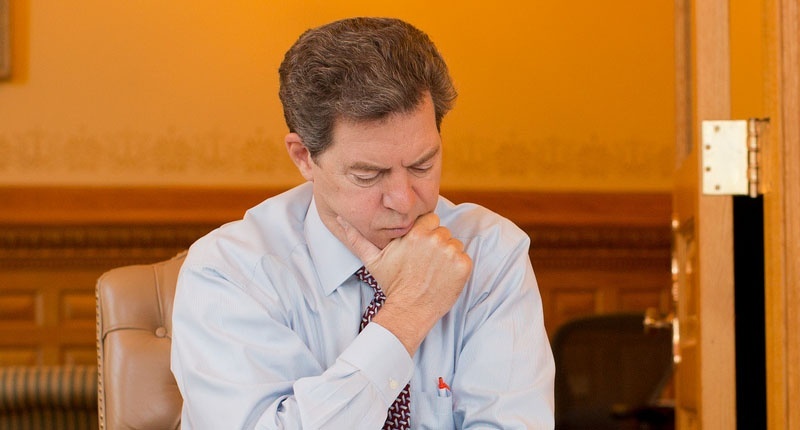 How does the Brownback budget plan to plug that hole? His budget reneges on the promise to pay KPERS back AND proposes that KPERS payments for the next two years be no more than they were in 2016. In other words, his budget robs the $115 million from KPERS (the delayed payment with the required interest) and stops meeting the recommendations of actuaries adopted in an effort to stabilize a system which had suffered from chronic underfunding. And legislators are angry. All of the heavy lifting the veteran legislators have been doing in recent years to put the system back on sound financial footing is undone in the Governor’s budget. By the Governor’s own admission, his plan would add 10 years to the period of time needed to bring the system into balance. Lawmakers – and KPERS advocates – were delighted that changes made over the last few years would have resulted in actuarial balance by 2033. The Governor’s new plan, if adopted, would push that out to 2043. And worst of all, the Governor’s proposal would not deal at all with the underlying budget problems. It is one-time money meant to plug today’s budget hole but does nothing to solve the growing chasm in future years. Reckless and irresponsible: robbing the highway fund, robbing KPERS, cutting back on Medicaid reimbursement rates, dismantling support for early childhood programs. We could go on. This will be Sam Brownback’s legacy. Governor gives State of the State address and promises that KS is “leading the planet” by many measures of success. Governor promises to hold to his failed tax reform policies. Governor’s education policies outline a litany “reforms” that have failed elsewhere promising they will work in KS: merit pay, uncertified teachers, and more tax credits and vouchers for unaccountable private and for-profit schools. Article includes links to full text of Governor’s address along with response by Senator Anthony Hensley. Governor’s budget as outlined by Budget Director Shawn Sullivan includes more of the same, robbing from highway funds, sell-off of Children’s Initiative Fund, and sin taxes. Governor Sam Brownback gave his annual State-of-the-State address last night and what a work of art that was. He started off by reminding all of us of how great things are in Kansas now that his 2012 tax plan has taken full effect. He says we have created thousands of jobs, quality of life is better than ever, and, well, the sun is shining in Kansas. It’s the mantra he and his staff and allies have been chanting repeatedly as revenue estimates continue to collapse and every state service is decimated by budget cuts or highway robbery. This sunshine, he says, is why the legislature must not back off one bit on his tax plans. Not even on the patently unfair and irresponsible elimination of all income taxes on more than 330,000 businesses in Kansas. No, he told us, those tax breaks are creating jobs; jobs that only he apparently can see. Next, he launched into his great joy at the election of Donald Trump and his delight at the strong possibility of the repeal of the Affordable Care Act (aka Obamacare). It’s going away, he proclaimed, and so this is the wrong time to expand Medicaid. Yes, Governor Brownback continues to refuse to take millions of dollars offered by the federal government – dollars that Kansans are sending to the federal government in taxes – and provide a modicum of health care security for the working poor of our state. He had plenty to say about education too. Just as he proposed in 2012 that Kansas adopt Arthur Laffer’s discredited trickle down economic tax theory, he now has a set of discredited education “reforms” he wants the legislature to enact. 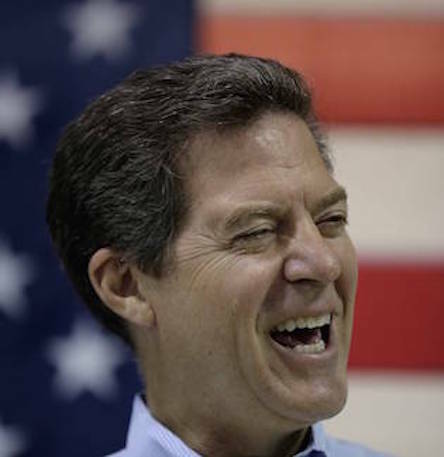 Well, Governor Brownback has had his chance. He has had six years to enact good policy. In that time he has gutted the state budget, decimated state services, robbed our highways of needed funds, and boosted our sales tax such that Kansans pay the second highest food sales tax in the nation. He eliminated a constitutional, effective school finance system for a block grant system that harmed every district budget. But now he says he wants to lead on education. Too late, Governor Brownback. The people of Kansas have seen what his policies have accomplished and they want no more of them. That’s why they tossed so many of his allies out of the legislature in August and November. It’s time for Brownback to step aside and leave the work to the new legislature; the legislature that was elected specifically to reverse the damage Brownback has done. Read the full text of Governor Brownback’s State of the State Address by CLICKING HERE. Budget Director Shawn Sullivan appeared before several committees today to share the details of the Governor’s budget proposal. In a nutshell: more of the same. The proposal shifts money around, raises a tiny bit of new revenue, steals more out of the highway fund, and proposes selling off future tobacco settlement payments for some short term cash. It also appears the Governor would like to make a 4th attempt to securitize the Children’s Initiative Fund. Read Kansas Action for Children’s response to this latest attack on our youngest Kansans by CLICKING HERE. Increasing the liquor enforcement tax from 8% to 16%. The most surprising part of his education budget proposals is to save money by consolidating all school districts into one state-wide health insurance plan. He says this was a recommendation from the Alvarez and Marsal Efficiency Study from last year. It was, but A&M was clear that this should not be done until there was a thorough examination of the implications for districts and employees. There is a study being conducted, as we speak, by the Division of the Legislative Post Audit to do just that. That study is due in March. It seems the Governor is jumping the gun on this one! None of these proposals are done deals. The presentation has not been met with particular enthusiasm in a legislature tired of budget gimmicks and focused on how to solve the long term mess brought about by the Governor’s tax policy. We’ll keep you posted on how all of this proceeds. It will all take some time. Guru Emeritus of School Finance, Deputy Commissioner Dale Dennis briefed the K-12 Education Budget Committee on the reality of school funding in Kansas – past history and present experience. True to his word in convening his committee, Chairman Larry Campbell (R-Olathe) is providing the best resources to educate his committee members on the challenge of school finance before launching into the design of our next system. What a surprise. Governor Brownback has suddenly awakened to the fact that his legislative allies are being thrown out of the legislature by angry voters. And Brownback knows what we all know – the leading issues for Kansas voters are the slow demise of Kansas’ quality public education system, the patently unfair Brownback tax system that benefits the wealthiest Kansans at the expense of middle and lower income residents, and the general collapse of the state’s budget that is damaging our highways, public safety and the social service safety net. Now he’s in a panic that the voters are going to throw out more of his allies and that the new legislature will work to reverse the anti-education, anti-government agenda he has promoted for the past six years. Make no mistake, this is a political move. A move intended to fool the public into thinking that he cares. No, he doesn’t care. He wants to continue the path toward the elimination of public services including public education. The Governor says he wants to lead on school funding. Well, he had his chance. For the past six years, when he could have been a leader, he has rejected the voices of educators. He has ignored school board members, school administrators, and teachers. He put together education study groups that he packed with anti-public education zealots. He and his legislative allies have taken all of their input from the anti-government, Koch funded folks who have bankrolled their campaigns. The Governor and his hand-picked education “advisors” have deliberately refused to listen to teachers in particular. The Governor’s education policies have been written by “advisors” that included Dave Trabert of the Kansas Policy Institute and Mike O’Neal of the Kansas Chamber of Commerce. Leading his advisory groups have been anti-government zealot Sam Williams and the extreme right member of the State Board of Education, Ken Willard. When teachers asked to appear before these committees they were told that there was no time for teachers. If teachers had something to say, we were told, they could write a letter or email the committee members. We were among those receiving a letter from Brownback’s office letting us know how to provide input in the development of a new school finance formula. We were happy the Governor finally decided that teachers might have some ideas (it’s taken him six years to figure this out). Sadly we note that he has no plans to provide for hearings and public forums. Instead we are asked to submit our ideas via email. And we should note that while a number of Kansas school districts, KASB, USA/Kansas, the Kansas PTA, and a number for other education organizations were asked to participate, the invite was also extended to some of the most virulently anti-public education organizations in the country including the Kansas Policy Institute, the Kansas Chamber of Commerce, the Heritage Foundation, the Brookings Institute, and the Friedman Foundation. All of those organizations work primarily to strip money away from public education and send it to unaccredited and religious schools in the form of vouchers and tuition tax credits or scholarships. The reality of the Governor’s sudden interest in showing some “leadership” on education is the fact that the public has soundly rejected all of the Governor’s ideas up to this point. On August 2, Kansas voters ousted many of the Republican legislators who have blindly followed Dave Trabert, Mike O’Neal, and Sam Brownback in enacting their policies. Most observers believe that more of his allies will lose their bids for re-election in November. We’re ready to help make a responsible and constitutional school finance formula a reality. But we believe the leadership in creating such a formula will come not from the Governor’s office but rather from a new, more responsible legislature sent to Topeka by Kansas voters who have tired of the Governor’s reckless policy agenda. 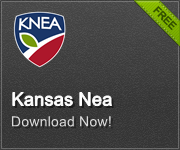 At KNEA we will continue to seek out, elect, and work with legislators who will put Kansas and Kansans ahead of an extreme anti-government ideology; who will pull Kansas back from the edge of the fiscal cliff and once again provide for quality state services that support the high quality of life we have come to expect. In the meantime, we do encourage you to let the Governor know your thoughts. We hope you will take advantage of this to give the Governor a piece of you mind. You don’t have to sketch out the details of a new school finance formula. We suggest that you simply suggest ways in which a new legislature might provide for an adequate and equitable school finance formula that meets the needs of our students. Kansas can’t provide adequate funding when tax revenues continue to decline. It’s time to roll back the irresponsible tax cuts that have benefited the wealthy and been punishing to middle and low income Kansans. Put business back on the tax rolls, stop the “glide path to zero income tax,” and get our state budget back to stability. Elevate the advice of education practitioners including classroom teachers and parents with children in public schools over that of anti-government organizations like KPI and the KCC. Increase funding to the levels promised by the legislature in 2005-06. Reinstate the prior school finance formula and focus only on modifying it with input from educators – school board members, school administrators, and classroom teachers. The plan put forward by KASB and USA/KS is an excellent starting point. Put money directly into increasing the salaries and benefits of all teachers. Not just a few – ALL. College graduates leave Kansas public universities with undergraduate debt in excess of $23,000 and start teaching with salaries as low as $27,000. All teachers need to be better paid. Current research shows that the gap between teacher earnings and the earnings of others with the same required level of education is widening. Enhancing the salaries and benefits of all teachers will go a long way to making teaching an attractive career option. Any changes to the school finance formula must allow it to respond to changing needs (increases in enrollment, student needs such as at-risk and bilingual, and shifts in local property tax valuations), and must be adjusted annually for inflationary increases and increased expectations. Repeal statutes that strip money away from our public schools and send it to private schools including unaccredited schools. Start by repealing the tuition tax credit program and return that $12 million to our public schools. Demand that all legislators immediately stop bad mouthing teachers and their union. This rhetoric and the continual attacks on teachers only serve to discourage young people from becoming teachers and encourage those now teaching to retire as soon as possible or just quit. These are just a few ideas. We know that teachers have plenty more. So send those ideas in to the Governor at StudentsFirst@ks.gov. And while you’re at it, check out the KNEA list of education friendly candidates for the Kansas House and Senate. Volunteer for those candidates and vote for those candidates. Discuss the importance of a pro-public education legislature with your friends and neighbors. And on November 8, let’s finish the job we started on August 2. A Great Day for Kansas! Yesterday in the Kansas primary elections supporters of the Brownback experiment were removed from office. Six incumbent Brownback allies in the Kansas Senate lost their bids for reelection to moderate Republican challengers. Tom Arpke, Terry Bruce, Forrest Knox, Jeff Melcher, Larry Powell, and Greg Smith were all ousted. In addition, two more Brownback allies who were vying for open Senate seats – Virgil Peck wanting to replace Jeff King and Larry Salmans hoping to replace Mitch Holmes – found themselves on the losing end of their challenge with moderate Republicans winning both primaries. Two moderate incumbents who were being challenged by Brownback conservatives – Vicki Schmidt and Carolyn McGinn – both won reelection. Over in the House, eight Brownback allies lost their bids for reelection. Craig McPherson, Brett Hildabrand, Rob Bruchman, Jerry Lunn, Charles Macheers, Connie O’Brien, Will Carpenter, and Kasha Kelly all went down in defeat. Conservative John Faber lost his comeback attempt out west. Open seats formerly held by Brownback conservatives (Marc Kahrs and Kevin Jones) were won by moderates Roger Elliot and Brenda Dietirch. Moderate incumbents facing conservative challengers – Susie Swanson, Steven Becker, and Greg Lewis – all won their races. All these moderate Republicans ran on a message of tax fairness and real support for public schools. It was very clear that the public was behind the moderate comeback. Over in Johnson County where two incumbent senators and six incumbent house members were defeated by moderates, KNEA members worked like never before. And the teachers were bolstered by an unprecedented level of public support. Kansas Families for Education, Game On for Kansas Schools, and Stand Up Blue Valley – citizens groups formed by angry and frustrated parents – grew in strength and resolve. It was teachers, parents, and concerned citizens who chose to engage in politics and who led the battle on behalf of common sense candidates. But the turning out of conservatives was not just a Johnson County issue. Statewide voters have had enough of the Brownback experiment. An experiment that has bankrupted the state leaving our schools, highways, public safety efforts, and social services in jeopardy. It happened in southeast Kansas with the defeat of Virgil Peck and Forrest Knox; it happened in central Kansas with the defeat of Terry Bruce and Tom Arpke; it happened in southern Kansas with defeat of Kasha Kelley; it happened in western Kansas with the defeat of Larry Powell. 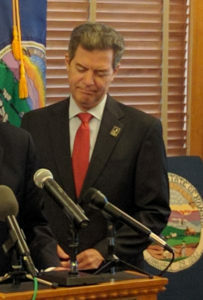 This is a statewide repudiation of the path Brownback and his allies have set upon Kansas. Let us not forget that we can send another message to his remaining allies in November. From the Wall Street Journal: “It’s not a repudiation of either side but of the legislature in general for not dealing with the core issue,” Mr. Trabert said reducing the cost of state government by 6% to 7% would enable the state to keep its lower taxes and balance the budget going forward. None of the victorious Republican moderates ever campaigned on the desire to cut state services any more. None of them campaigned on the promise of continuing Brownback’s experiment. They campaigned on returning Kansas to a common sense center; a state with a fair tax system that provides the necessary revenue to maintain the high quality of life for which Kansas is known. Today is day to savor these victories. We all woke up with a renewed sense of hope for our state. But this is not over. The Governor still holds a veto pen with which to threaten these new legislators. There is still a general election during which the forces that brought us Brownback – the Kansas Chamber, KPI, Americans for Prosperity – will unleash their fury on Democrats, hoping to stop any further losses in their anti-government conservative caucus. We savor today and we gear up for tomorrow. We must carry our efforts forward to November to protect our Democrats. We must seek to replace more of the Brownback allies now with Democrats. We helped the moderate Republicans defeat Brownback conservatives in August. Let’s help the Democrats defeat some more of them in November.